I pressure myself more than anyone else does. Do you ever feel like you’re running behind yourself, screaming in your own ear to pick up the pace? Move faster. Think up a better word. Write a better book than last time. Write a better book than you think you’re writing now. Do not disappoint them. Do not disappoint yourself. You’re not working hard enough. Move, move, move! I joked about the five compartments of my brain on Facebook, but really it’s the truth. My mind is really filled up with only five things right now. Can we have a pie chart? Truth is, I’m stressed out. I need to go home. Why does it always happen that when I decide I need to go home it’s dark and I can’t find my shoes? I know. I’m not myself. You wouldn’t want to see mine. However, the worry about book parts would probably be similar. Does John Cusack take up 10% of your chart? Maybe 5%? 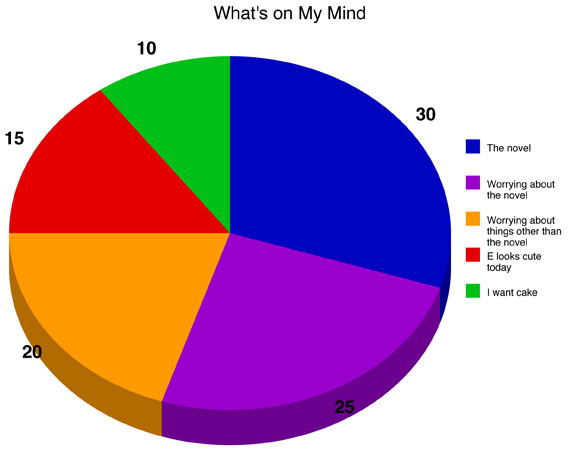 This pie chart cracks me up! Seriously though, last year at this time I was coming up on my deadline, and I think it literally made me ill. I still got the manuscript done on time, though, and so will you! I agree. NO MATTER WHAT, I will make my deadline. I always find a way to. In fact, I love the urgency and agony that comes with deadlines. Makes you feel alive. I don’t know if I’d finish anything otherwise. The things languishing on my hard-drive, never fully written, are that way because no one gave them a deadline! You’re right: It’s the best kind of stress to have!